Bluebridge, a Fishers, IN-based software company specializing in mobile apps for churches, employers, and tourism entities, announced last week that it sold off two of its business units in order to devote its energy to Emplify, its fast-growing employee engagement app. PushPay‘s e-church division, based in Redmond, WA, acquired Bluebridge Churches, while Tucson, AZ’s Simpleview bought Bluebridge Tourism. The two separate transactions netted Bluebridge a total of $8 million. According to a press release, Bluebridge will now focus its attention on further growing Emplify, an app that allows employers to connect and stoke engagement with their team members, enabling an easy way to offer feedback. Emplify also offers surveys and analytics that can provide additional business insights to its customers, which include NFL Trust, Duke Realty, Molly Maids, and Which Wich. Emplify began as an employee-led group inside Bluebridge that was tasked with better engaging their co-workers. When Xconomy talked to him in August, Bluebridge founder and CEO Santiago Jaramillo said the project began in part after a meeting where Bluebridge execs wanted to reward staffers for an excellent year. They went around the table batting around ideas. “After 55 minutes, we landed on bringing in snacks for our employees,” Jaramillo recalled. But snacks seemed like a fairly uninspired choice, so the executives decided to send out a quick electronic poll asking employees to weigh in. “Within five minutes, 90 percent responded, and the top answer was, ‘Please get 401k matching before snacks.’ We did that, and it made our employees feel absolutely cared for. It’s magical what happens when you empower employees to have a voice,” he said. After months of development in stealth, Bluebridge launched Emplify as a stand-alone company in July after a $3 million Series A funding round led by Allos Ventures and Cultivation Capital. 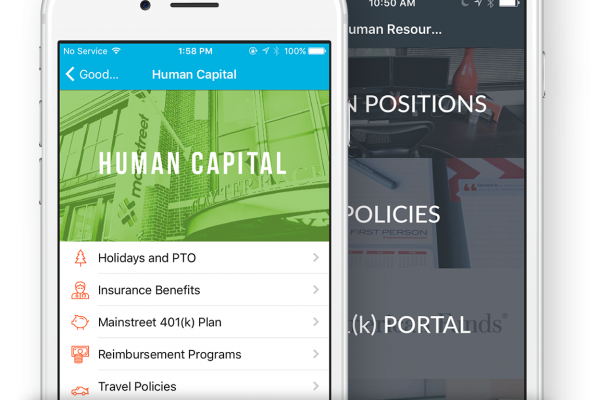 Today, the app offers links to human resources, payroll, a staff directory with pictures, fun facts, and surveys. Jaramillo used Molly Maid, an on-demand cleaning service with a network of employees working from home, as an example of how Emplify can help. Jaramillo also pointed to the workplace changes being ushered in by millennials, a huge demographic that has demonstrated contempt for old, static business process models. They want to work from home on their own devices and have plenty of work-life balance compared to older generations in the workplace. After a summer of steady growth, Emplify now has more than 50 employees dedicated to its success. Jaramillo said he’s excited about Emplify’s potential in a world where so many disconnected workers complain of feeling like just another cog in the wheel.